Eating right isn't the only lifestyle factor Canadians need to focus on for better health. Physical activity plays an extremely important role in improving quality of life, maintaining a healthy weight, and reducing risk of heart disease, stroke, high blood pressure, type 2 diabetes, osteoporosis, and some types of cancer. Canadian adults are more active now than 20 years ago but according to the Canadian Fitness and Lifestyle Research Institute more than half are still considered insufficiently active for optimal health benefits. The amount of activity recommended by Canadian Physical Activity Guidelines is at least 150 minutes of moderate to vigorous intensity exercise each week for adults, in bouts of 10 minutes or more. It is also beneficial to add muscle and bone strengthening activities using major muscle groups, at least 2 days a week. More physical activity provides greater health benefits. Women tend to be both less active and less vigorously active than men. Inactivity increases with age and is higher among less educated and lower income groups. 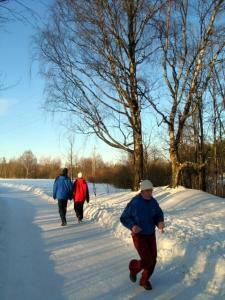 Walking is the most popular activity regardless of age, followed by gardening, and home exercise. An active lifestyle is key to maintaining a healthy weight and preventing weight gain leading to obesity. Regular exercise has been shown to improve control of blood lipids, diabetes, hypertension and obesity, with the greatest benefits realized by sedentary individuals who being to exercise. Regular physical activity can even be protective in individuals who are classified as overweight or obese. Regular exercise also helps us cope with stress and depression, and improves our mental health and our sense of well being. It helps us feel good about ourselves. Activity levels typically decline with increasing age. As we become less active we require fewer calories to maintain our body weight. With aging there are also physiological changes which contribute to changes in body composition such as decreased lean muscle mass and increased body fat, especially around the middle. Menopause is a particularly high risk time for weight gain in women. As we age we need to make the adjustment to eat less food or be more active or else weight gain will result. Strength-training such as lifting weights or performing weight-resistance exercises as little as twice a week can help maintain or increase muscle mass. A body with a higher muscle mass will burn calories at a higher rate than a body with more body fat. Studies at Tufts University Research Center on Aging have shown that regular strength-training helped older women increase their muscle mass, increased muscle strength, and increased their bone mass. Exercise is a key preventive action against osteoporosis. Activities that are best for heart health include those that increase your heart rate for a sustained period of time (e.g. 20 minutes or more). Brisk walking, stair climbing, swimming, cycling, dancing and jogging can all get your heart rate going. When it comes to fitness, you have to make time to be active everyday. Each activity you do during the day can be counted towards your fitness goal of at least 150 minutes per week. The intensity of the activity should be comparable to brisk walking. Try to include a variety of different activities. Walking to the store or mailbox, walking the dog, going for a bike ride, stretching or doing calisthenics at home, playing racquet sports, dancing, golf (if you walk, not ride), house cleaning, and even playing actively with children all count. For maximum health benefits, regular physical activity must go hand-in-hand with a nutritionally balanced diet. For books to help you get active check out the book review section of this website. To find a fitness formula that works for you check out Canada's Physical Activity Guidelines.